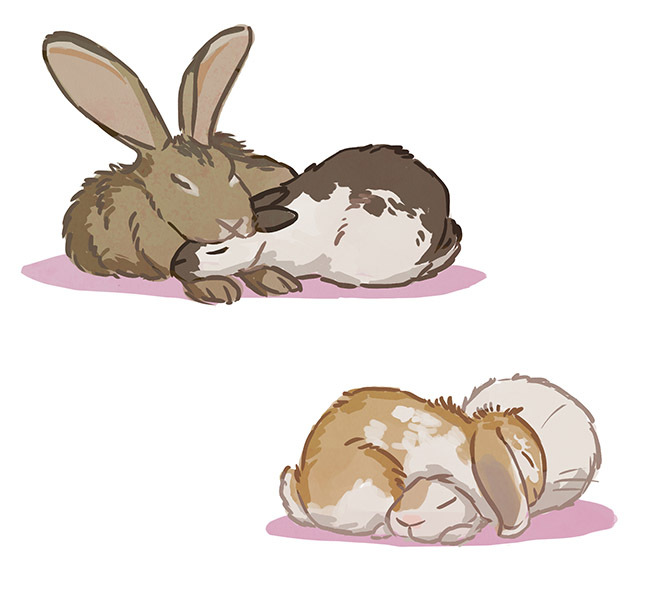 I've been visiting my parents this week, and their pet rabbits were being cute and using each other as pillows. Some news - for the next three months my husband and I are going to be traveling to New Zealand and Australia. We're going to continue to work from our laptops while traveling around. I'll continue to post drawings here, as usual, and I'll post a few photos from our trip too! The past few weeks have been crazy. Not only did I have a lot of work to do on drawings, and on Crea, but we also packed up all our stuff and put it in storage. Next my husband and I drove from Oregon to California to visit our families. Today we fly to New Zealand - a whopping 13-hour flight. Blog readers, next time you hear from me again I'll be halfway across the world. See you then! Looking forward to seeing some of your travel snaps, it's always interesting to see how others see the country you live in! Hope you have a fabulous time! And those bunnies are very cute! I just now found this post. I love the drawing!!! Of course since Sam just passed his sketch is particularly poignant. Thank you!